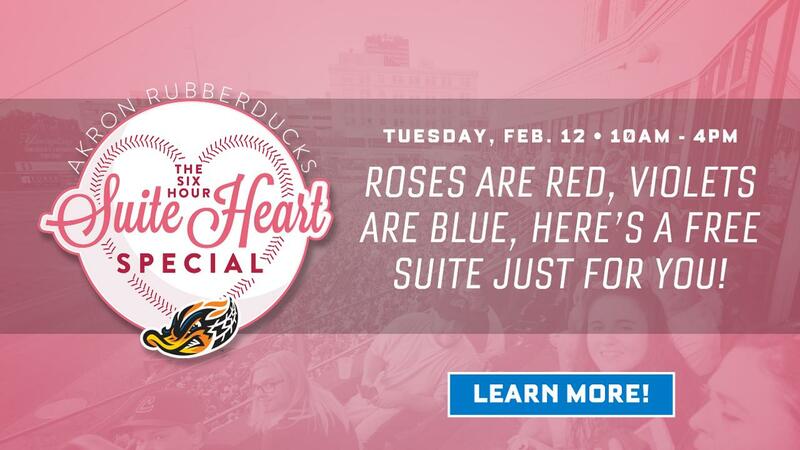 (AKRON, OHIO) February 5, 2019 - With Valentine's Day and Cleveland Indians' pitchers and catchers reporting day on the horizon there is baseball love is in the air, which means it is time for the fan-favorite, Akron RubberDucks' annual "Six-Hour Suite Heart Special" on Tuesday, Feb. 12 from 10 a.m. to 4 p.m.! The "Suite Heart Special" is chance for fans to qualify for one of two different value-added packages, including one with a complimentary suite! In addition, all accounts are entered in the grand prize drawing for the use of the exclusive Owner's Suite. This special is ONLY on Feb. 12 from 10 a.m. to 4 p.m. Purchases can be made by calling the Akron RubberDucks' main number, 330-253-5151, 1-855-97-QUACK (78225). Packages will be sold based on availability. A first-pitch opportunity at a Monday through Thursday game. Grand Prize Winner will receive a complimentary night in the Owner's Suite; drawing done randomly from among all accounts. "Our fans mark their calendars for this big, annual sale," said RubberDucks General Manager Jim Pfander. "They love the chance to get a free suite to impress family and friends, and with Valentine's Day less than 10 days away, it makes the perfect last-minute gift!" There is a limit of one value-added incentive per account. Food is available for optional purchase in suites, however, not required at the time of entry. Existing accounts with deposit money received are eligible if the additional payments are not toward an existing five-year season-ticket contract. Current five-year season ticket contracts are not eligible for the value-added incentives.